Gros Morne National Park, Newfoundland. Unofficially, Gros Morne National Park is naturally divided into two parts by Bonne Bay. So far we have explored the large northern portion which includes Western Brook Pond, interesting coastline, and the town of Rocky Harbour etc. Today we head over to the opposite side via highway 431, exploring as we go. Before we left the northern section, we checked out the Bonne Bay Marine Station in Norris Point. As well as being a tourist attraction full of information and touch tanks, it is also an important teaching facility for the Memorial University of Newfoundland and a marine research laboratory. Because we were driving to the southern end of Gros Morne, we briefly left the park before turning onto highway 431, we returned to the park approximately 15 kilometres later. We headed straight for the historic town of Woody Point and parked at one end of the town to walk the length of Water Street to the Woody Point Lighthouse with views over the beautiful Bonne Bay. We checked out several of the town's historic properties such as the Roberts House and store, and the Woody Point Heritage Theatre all built in the early 1900's. As we wandered back to the camper the way we'd come, we were both feeling rather peckish so ducked into the Granite Coffee House for a grilled cheese sandwich (toastie) and coffee before hitting the road again. At the turn off towards the Tablelands, we stopped in at the Gros Morne Discovery Centre which features a range of exhibits and has screeds of information about the geology and wildlife of the area. 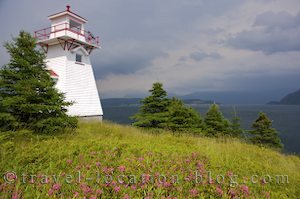 A definite must visit during a trip through Gros Morne National Park. By the time we were finished browsing through the centre the weather was closing in with fingers of fog creeping over the hills and dark clouds above, so we left the Discovery Centre and headed for that evening's destination of Trout Pond Campground, in driving rain. Soon after we arrived, the weather abated long enough for a brief walk along a section of beach which fringes the pond.